This simple application lets you start BBC television programmes online with a couple of key presses. It's easy to use with any screenreader - much simpler than the BBC site. So you can enjoy television programmes without lots of technical knowledge or difficulty. However, you will need to get it all set up once with the BBC sign-in and over-16 check and all those new things the BBC require. You may want to get someone sighted for that, but you should only have to do it once. BBC iPlayer TV is free. You can get it from the link below. You will then have a desktop shortcut called "BBC iPlayer TV" that you can use to start the program. 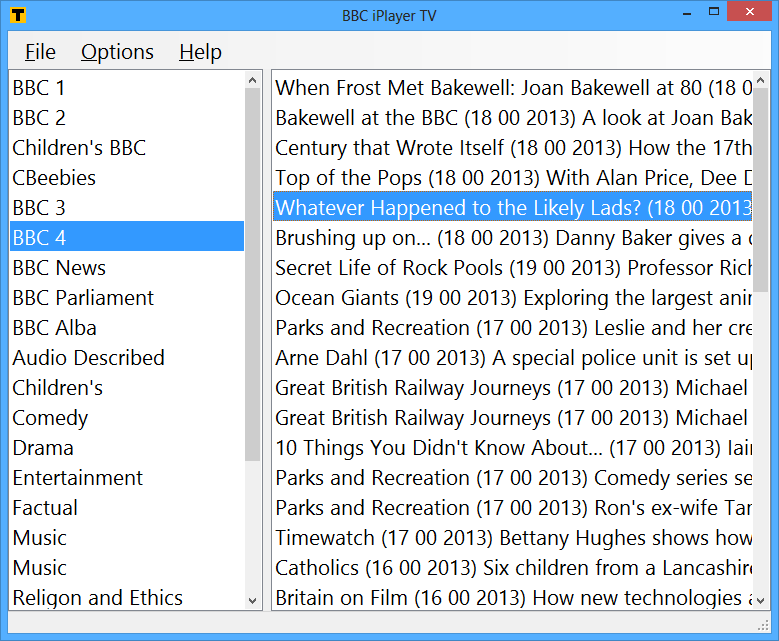 You can also find "BBC iPlayer TV" in your Start menu. Installer MSI for BBC iPlayer TV Download and run. You need to be on Windows XP Service Pack 3, Windows Vista Service Pack 2, Windows 7 Service Pack 1, Windows 8.1, or Windows 10. 32- or 64-bit versions are all supported. The Microsoft .Net Framework 4 Client Version is required. If you need help, call me on +44 7983 244 131 or Skype me on Alasdairking. You can email support@webbie.org.uk but you're unlikely to get a response: this isn't my day job! Your system clock must be set to the correct date and time or some programs will not show and some will not play. Check that Internet Explorer, Tools menu, ActiveX Filtering is not checked. If this is checked then programmes may not play. One user had corrupted user settings (2017). The symptom was no stations loading when the program started up. To fix, go to the folder C:\Users\Your.Username\AppData\Local\Accessible_and_WebbIE and delete the folder(s) starting BBCiPlayerTV.exe. Another user had problems loading programmes, but on investigation they had a horrible virus that had broken loads of things. It's ALWAYS good to have the latest security patches and Windows Updates and use the Windows Defender anti-virus program. Finally, if you're having problems, check your firewall security software isn't blocking the program. Fixed programme listings not loading. Fixes the Audio Described programme list not loading. Fixes the disappearance of every programme from every channel! However, much slower to load each channel's listings. Signed channel listings now available. There was a 7.4.0, which was added windows Firewall rules and a 7.5.0, which used MSAA instead of scripting, but I've had reports that 7.5 didn't work, so I've rolled back to MSAA and fixed up this code. Fixed beeps playing when you get to the end of a list, not try to go past it. Known issues with this version: you must assent to the "I have a BBC TV Licence" dialog at least once before the program will work. Tab to it and press Space to assent. Fixed new BBC "You need a licence!" dialog. Fallen back to using MSAA to control IE, so should be more reliable. Programmes sorted into alphabetical order again correctly. Removed switching options and controls for forwards/backwards. Fixes programmes not starting on machines with Internet Explorer 11 installed after Windows Update 3008923. The downside is that you lose the skip and pause functions. The 7.3.0 release was broken: pressing keys did nothing. Fixed. The BBC has removed all their category information, so all the categories broke, including Audio Described. This version removes the broken categories: however, because Audio Described is so very useful, I've written some code to supply this category still. It's not as detailed as before but it has the programmes all listed in alphabetical order. Added TeamViewer link so can download/run easily. Added Flash link so easier to test/install Flash. Removed sizable panel to simplify UI for screenreader users. Fixed turning off the voice that says what's going on. No longer moving the mouse around and clicking, so programmes should start more reliably. Made going to fullscreen not break Dolphin users. Shows all programmes, even those which I think are no longer available, so hopefully fewer "where is my programme?" complaints, at the cost of displaying some programmes that are not available. Added skip forwards 30s and skip back 30s commands. Added beep when at end/start of list. Fixed access keys for stations and programmes. Update to fix the program after the BBC changed their website. The Pause functionhas gone, sadly. Increased the delay before starting a programme, which should make more programmes work. Removed the duplicate Music category. Added one-time online registration/activation for usage tracking. Added global error handling and Event Log registration. Changed Manufacturer to Accessible and WebbIE in line with previous versions.